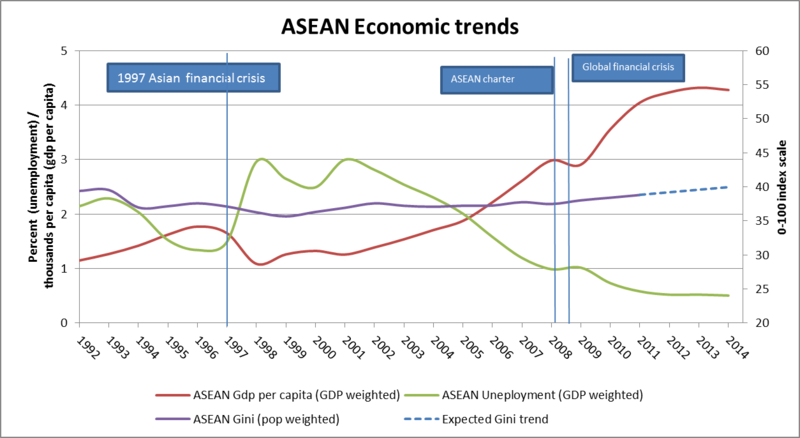 ASEAN economies have been growing rapidly over the past 15 years, yet despite productivity improvements and low unemployment levels; they have struggled to find a more inclusive economic model. 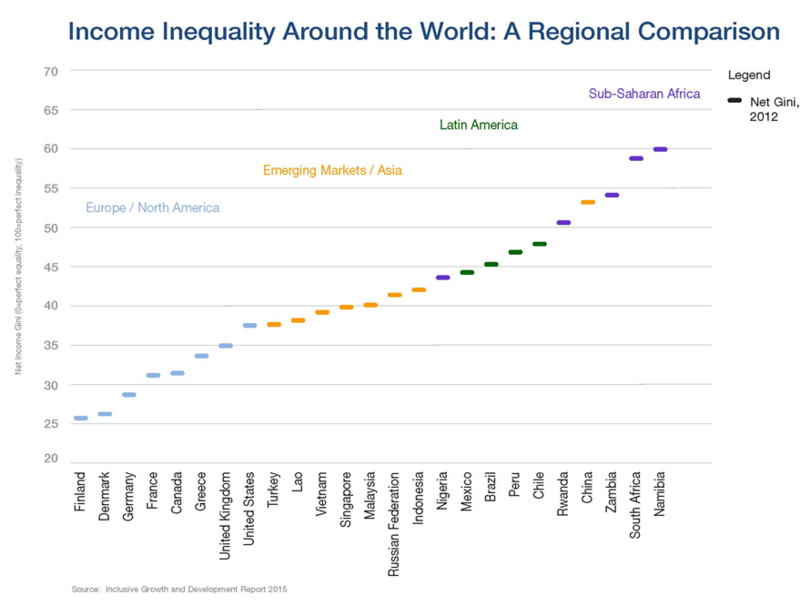 The most recent trends suggest that inequality is on the rise. In Asia, as elsewhere in the world, there is a growing consensus that economic growth should not be a country’s ultimate policy objective. Broad-based improvements in living standards matter as well. And while it is hard to raise living standards without economic growth, it is certainly possible for a country to achieve impressive strides in GDP per capita without most of the population feeling the benefit. But what does a country need to do to ensure that economic growth benefits all citizens? That is a relatively new question on the research agenda, one which has moved into the mainstream only as the aftermath of the financial crisis lays bare the shortcomings of previous assumptions in economics. The Forum’s new Inclusive Economic Growth and Development Report 2015 identifies 140 indicators that are thought to contribute to an economy’s capacity to grow inclusively. These 140 indicators are grouped into seven pillars and 15 sub-pillars (and ranked on a 1-7 scale). Not a single country scores above average in all sub-pillars relative to its peers, but Malaysia is one of a handful that come close. Yet, there are still many areas where it can improve vis-à-vis the top performers globally. How inclusive are ASEAN economies compared to peers? Malaysia has managed to share the gains of growth more equitably than many of its peers. On average, income inequality has been on the rise in ASEAN over the past two decades with a few exceptions, including Malaysia, Thailand and the Philippines. However, inequality still remains relatively high according to its gini coefficient of 40 out of 100, which is on par with the United States and 40% greater than Nordic economies. A comparatively low level of corruption is among the country’s strengths, with Malaysia ranking top among the 26 countries in the upper-middle-income range for indicators such as ethical behaviour of companies and public trust in politicians. Relatedly, it scores top on a measure of avoiding market dominance by incumbents. These factors are included because a fair, transparent and competitive business climate is considered to be essential for ensuring that anyone has the chance to participate and benefit from economic growth, rather than only those in entrenched positions of influence. For the same reason, the framework includes indicators on how easy it is to start and grow a business. The scores show that Malaysian businesses face relatively little burdensome red tape: it takes firms less time to handle tax paperwork in Malaysia than in any comparator country, and it is relatively quick – though not cheap – to start a new business, wind up a failed business, or enforce a contract. The culture is rated as the most entrepreneurial of all upper-middle-income countries, with failed enterprises more likely to be perceived as more of a learning experience than an embarrassment. Successful businesses in Malaysia have relatively few difficulties accessing the money they need to grow, with the country scoring at or near the top on indicators including access to venture capital and local equity markets, access to credit and availability and affordability of financial services. They can also count on top-notch infrastructure – including energy, transport and communications – according to the country’s leading rank on a measure of perceptions of infrastructure quality. With such a propitious environment for doing business, it is no surprise that Malaysia has the lowest unemployment rate among the 26 upper-middle-income countries (3.1%). The country is also rated top for pay and productivity, and capacity to prevent the brain drain of talented individuals when compared to its peers. The picture is more mixed, however, when it comes to essential services. Although the quality of Malaysia’s healthcare system is rated highly – the best among upper-middle-income countries, households face higher out-of-pocket expenditure on health than in most comparator countries (35%). On education, too, Malaysia tops the charts in perceptions of quality. Yet enrolment rates in pre-primary, secondary, tertiary and vocational education are lower than expected, and there is a relatively large gap in educational attainment between students from the wealthiest and poorest quintiles. Only 2.6% of students from poor socioeconomic backgrounds score in the top 25th percentile on PISA examinations. More needs to be done to put students from disadvantaged backgrounds into a position to seize economic opportunities. Malaysia also needs to do more to enable its female citizens to fulfil their potential. The gender gap is the fifth-highest among upper-middle-income countries in education and pay and third-highest in labour-force participation gaps, with only 44.5% of women participating in the labour force (well below the regional average of 59.2%). Finally, Malaysia could make much better use of fiscal transfers to tackle inequality. Among peer countries with comparable data, Malaysia has the most inadequate social assistance, and among the poorest coverage of old-age pensions (19.8%) and the lowest spending on social protection (3% including healthcare). Fiscal transfers make little difference to Malaysia’s inequality, as measured by the gini coefficient, compared with some countries at similar income levels. As the Inclusive Growth Report explains, contrary to widespread belief, the latest economic research makes clear that tackling inequality through redistribution can actually reinforce rather than dampen GDP growth. With such strong fundamentals in many other areas, targeted policy action on its remaining points of weakness could make Malaysia even better positioned to deliver strong economic growth with social inclusion. What do the next 25 years hold for East Asia?